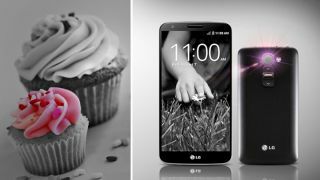 The LG G2 Mini seems locked on for a MWC 2014 unveiling after LG posted a photo of the back of the handset to its Facebook page. Well, we assume that's what it is, since it's a smaller handset pictured next to a bigger handset and that bigger handset is the LG G2. It's also joined by a big shoe and a smaller shoe, a big starfish and a smaller starfish and a big cupcake next to a smaller cupcake. Is there a hidden meaning to these seemingly random items? Will the LG G2 Mini come with a shoe-cleaning peripheral? A starfish fishing app? Or a free cake? It seems unlikely. Less unlikely is that the handset will feature the G2's funny back-mounted volume slider, a Xenon flash and a camera. We've heard all kinds of rumours about the G2 Mini's screen size, with the decidedly not-that-mini 4.7-inch option proving most enduring. The LG G2's display is a 5.2-inch affair and looking at the difference in size between the two handsets pictured, we'd say there's a good chance that 4.7-inch screen rumour will prove true. Not too long to wait until we know for sure - the caption under the photo on Facebook says, "Experience the MINI. Mobile World Congress 2014-02-24." What else should you expect from MWC 2014?